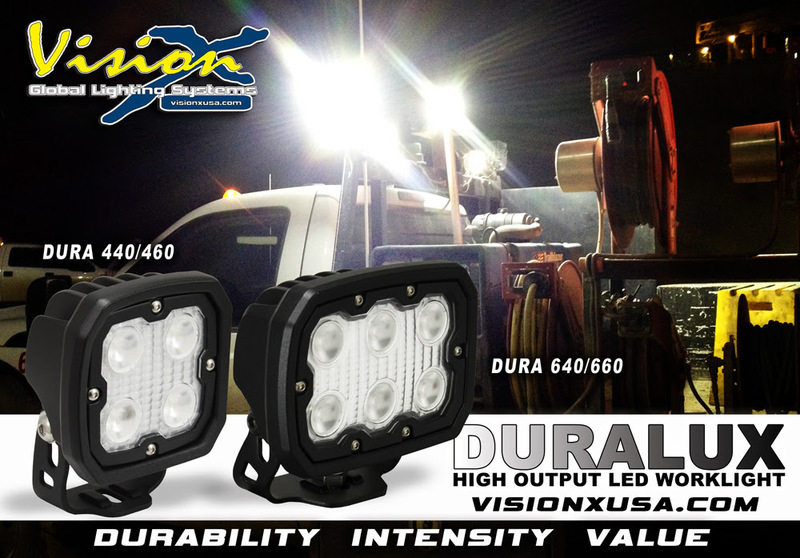 February 7, 2014 – Auburn, WA – Vision X Lighting continues to expand it’s work-duty line-up with the new Duralux Series LED lights. Designed with fleet vehicles and working professionals in mind, each light combines durability and affordability for many on-the-job lighting needs. Available in 4 or 6 LED and 40 or 60 degree beam configurations, each light provides outstanding distance and more light output than a 100 watt halogen light. Each Duralux light only draws a mere 1.6A (12V) from it’s 5 watt premium LEDS, reducing power consumption, leading to fuel savings and lower operating costs. The rugged die-cast aluminum housing provides superior protection against the elements, and the universal single-bolt mount allows for a great range of adjustment. Each light is backed by the Vision X Lighting Extended Warranty for added piece of mind. For more information visit www.visionxusa.com or call 888-489-9820.